There are many foods that can be preserved by dehydration. The method in which you dehydrate food isn’t going to alter the flavour or the shelf life of the food (if done properly) so does it matter what method you use to dry the food out? In this post, we will cover some of the pros and cons of using a dedicated food dehydrator vs. a regular oven. Should I Get A Dehydrator Or Use The Oven? These two methods of dehydrating food are probably the most common ways people are recommended to dry food so that is why we are concentrating on these two. There are, of course, other methods of dry. Methods that have been used for thousands of years like air drying are still in use today. Drying herbs, for example, is best done by air drying because you lose less of the delicate aroma and flavour of the herbs. 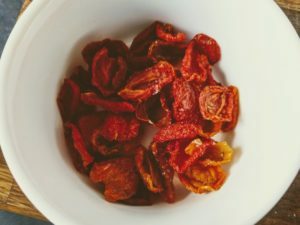 Sun drying is another method that is still in use with sun-dried tomatoes being the obvious candidate. Of course, not every climate is suitable for a method such as sun-drying so that is where appliances like dehydrators come in. A dehydrator or even an oven are able to dry most foods that you want to preserve and there is a degree of control which means you can ensure the food is first of all safe to eat but also that you retain the flavour and taste that you want as well. 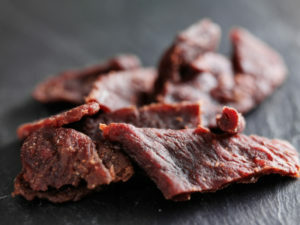 Dehydrating meat, for example, requires careful control of temperature to ensure the meat doesn’t spoil before it is dried. A dehydrator can do this and so too can an oven so that is why we are going to compare these two methods. Both a dehydrator and a conventional oven will dehydrate most foods in the same way so what are the benefits of using one over the other. Let’s start with oven dry, probably the most accessible form of dehydrating food because pretty much everyone will have an oven. Dehydrating food in the oven is pretty simple but there are some limitations. In most cases, you will want to set your oven to its lowest temperature. Whether you have an electric oven or a gas oven they are usually designed to work at hotter temperatures so achieving a good temperature for drying between 50°C – 70°C / 120°F – 160°F can take a little bit of fiddling. 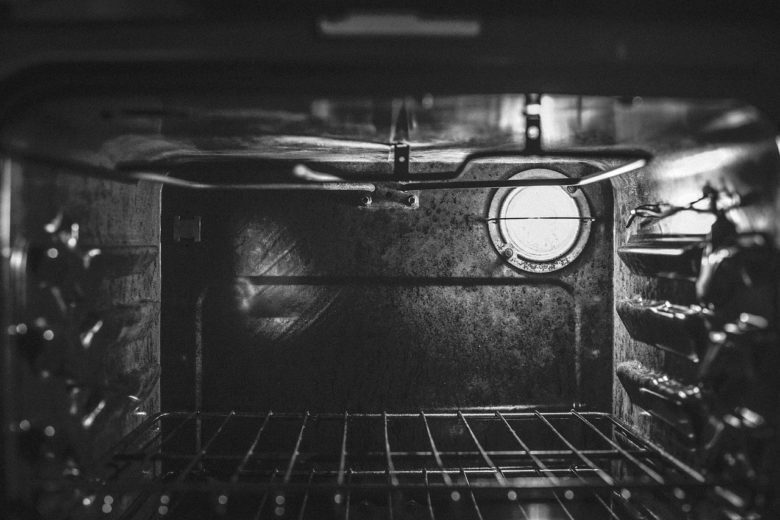 Some oven may struggle to maintain a temperature below 70°C / 160°F, in cases like this, you will want to prop the oven door open so that the temperature doesn’t get too high. The best way to keep an eye on the temperature inside the oven is with a dedicated oven thermometer. This will be a lot more accurate and enable you to closely monitor the internal oven temperature. 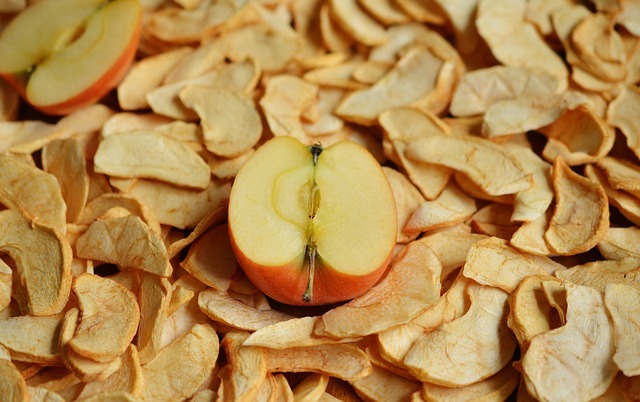 Airflow is another important factor in dehydrating food. Without good airflow, even with the correct temperature, the food will not dehydrate as well. A fan oven is desirable for dehydrating if not then you will need to open the door frequently to let excess moisture out of the oven. 1. Slice the food into 6mm / 1/2 inch thin strips. 2. Arrange in a single layer on a rack such as a cake rack to allow good airflow. 3. Arrange racks in the oven at drying temperature and monitor. Most food will take between 6 – 12 hours to fully dehydrate depending on the moisture content, to begin with. 4. When dried take out o the oven and leave to cool and dry fully for at least 24 hours before storing in a container. Almost everyone already has an oven so do not need anything to get started. Takes longer than using a dehydrator. Takes a lot more energy and is less efficient than a dehydrator. Harder to maintain constant temperature and airflow leading to poor quality dehydrated foods. Instead of repurposing the oven to dry food the other option is to buy a dehydrator specifically designed to dry food. Many dehydrators are fairly reasonably priced so this is definitely an option if you want to dehydrate food more than a few times a year. It is also a better option for a couple of other reasons which we will look at in a bit more detail now. Most models of dehydrator have controls allowing you to control the temperature and airflow to a much finer level than you would ever be able to achieve in an oven. This is not only important for getting a good quality dehydrated fruit, vegetable and meat, in the case of meat, for example, it is quite important. Meat needs to hit an internal temperature of at least 71°C / 160°F to be considered safe to eat and this is easy to achieve in a dehydrator without heating the meat too much that is cooks. This fine control is a lot easier than trying to achieve the same thing in the oven and therefore you get a more consistent and better end result. Dehydrators are also more efficient at dry food, not only in terms of the energy and time which are both less but also in terms of the amount you can dry. Most dehydrators have around 10 – 12 trays for drying which means you can fit a lot more produce into the dehydrator in a single go. This is more difficult to achieve in the oven without having to make racks yourself. It is also the case that food will dry quicker in a dehydrator than an oven this is probably the biggest benefit of using a dehydrator. If you are drying food in the oven then you cannot use the oven for however long it takes to dehydrate the food, which could be between 6 – 8 hours. A dehydrator will sit on the countertop and dehydrate food in less time, use less energy and doesn’t require much supervision at all. If you plan to dry food more than a few times a year or if you have a lot of produce you want to dry then a dehydrator is a good investment in my opinion. If you dry food every now and again then an oven is able to do the job so you might not need a dehydrator. 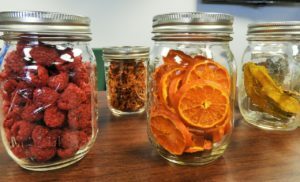 Ultimately both are able to dehydrate produce but if you plan to make jerky every few months, for instance, maybe a dehydrator is a better option. I want to make Rogosa Rosehip tea. This is my first time drying anything at all. I will be using the oven, and it indicates 120-160 F for drying the Rosehips. How long should I do this, and is it beneficial to cut them in half to make them dry quicker? I do not have experience drying rosehips myself so I cannot give you a definite answer. I have used rosehips before and they don’t seem to have a great moisture content so I would dehydrate them for a couple of hours and then begin checking them every half hour or so by removing from the oven and allowing them to cool and check their moisture level. The flesh of the rosehips should feel dry and pliable but not crack when bent. Great post! Thank you. I want to get started with dehydrating and this is just what I needed to know. I’m going to use the oven first to see how it goes before I get another gadget!